“Learn Go Week” rolling in 21 countries with 60+ events; still time to join in! Learn Go Week started last weekend, with go players all around the world — 60 events in 21 countries – running teaching events in their local communities. The first-ever event runs through this coming weekend, so if you want to get involved, you can still run a beginners’ night at your local go club this week; click here to let Go Game Guru know about it. This weekend, on September 21, 1004 go players in Korea will attempt to break the Guinness World Record for the most simultaneous games of Go in one place, the headline event at Seoul’s Street Without Cars festival. Last Saturday, the San Diego Go Club sponsored a go demonstration and teaching event at the Japanese Friendship Garden in Balboa Park in San Diego. “Dozens of people touring the garden stopped by the koi pond site to play a game or learn the basics of go,” reports club president Ted Terpstra. And in Raleigh-Durham-Chapel Hill, North Carolina, the Triangle Go Club of hosted Yuan Zhou to come from Maryland for a public outreach event (right) on September 13 in the community room of the Earth Fare grocery store. 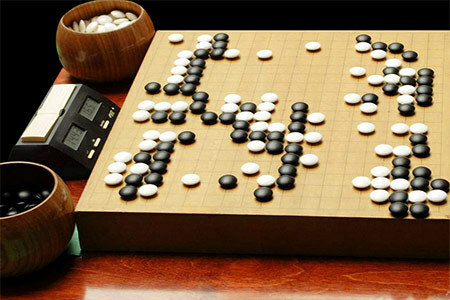 Zhou gave a lecture on the history and cultural aspects of go in China, and also played a simultaneous exhibition match against eight local players. “Triangle Go Club members and Zhou also chatted with onlookers about the game, played friendly demonstration games outdoors, and distributed Way To Go’ booklets,” reports local organizer Paul Celmer. Click here for Go Game Guru’s report on Learn Go Week activities thus far, including lots of cool photos of events in places like Canberra, Australia (left).